Fifteen years after Napster was shut down record labels are still in trouble and even Spotify is haemorrhaging cash. Britain’s musicians are dominating the world right now. Last year three of the top five selling albums were recorded by Brits (Adele, Ed Sheeran and Sam Smith). British artists were behind 17.1% of all music consumed globally, according to the British Phonographic Industry association - higher than every other country, ever. This should be a boon for the country's record labels, but the industry is struggling to turn success into cash. Though consumption as measured by the industry’s ‘Album Equivalent Sales’ metric rose by 3.7% in the UK last year (or 12.9% if you include streaming of music videos through services like Youtube), revenue from sales and streaming dropped 0.9% to just £688m. 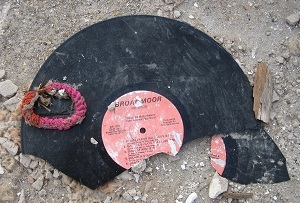 Read more: Who killed the record industry? Back in the days of records, tapes and CDs, the music business model was straightforward. Discover a good (marketable) artist before your competitor, get them played on Radio One and sell a bunch of albums. That all changed after the launch of file-sharing site Napster, which allowed users to download pirated music, back in 1999. The music industry managed to get it taken down within two years but the cat was out of the bag – consumers wanted to access music over the internet, and they weren’t keen on paying much for it either. What followed was a series of more legitimate services by tech companies who wanted a slice of the industry. First there was the likes of Apple's iTunes, which allows users to download songs. Then along came Spotify, which took advantage of speedier internet connections to allow users to stream music instead of keeping it. That means they have to keep paying a fee every month (or endure advertising) if they want to continue listening to their favourite Ed Sheeran track. They may have resisted at first but record labels did eventually wake up to the elephant that was eating their room and now all of the big three (Universal Music Group, Sony Music Entertainment and Warner Music Group) are investors in Spotify. That hasn’t been totally fruitless. Labels’ and artists’ revenues from paid streaming services like Spotify and Deezer jumped 69% to £146.1m last year. But advertising-funded services (a space dominated by Youtube music videos) aren’t keeping up the tempo. They represent around a fifth of all music consumption but generate just 4% of the industry’s revenues. The number of songs streamed through such platforms almost doubled last year but revenues from them increased by a paltry less-than-1%. Unsurprisingly the industry is pretty upset about it. It would be easy to write this off as another case of luddites failing to keep up with technological change but the BPI is right to be concerned. As a result of the shift away from physical music sales (despite a surge in nostalgia-fuelled vinyl purchases) the total market is shrinking – it’s down almost half from the £1.2bn of UK revenues in 2003. That means less money in the pockets of record company execs but it also means less money to spend on developing acts, and less money for the artists themselves. You might not care about harming the bank account of Adele, who has an estimated net worth of around £85m, but smaller acts are struggling to eke out a living from the internet too. Like many online markets music has become a winner takes it all environment, where the top artists take home an increasing share of the spoils but the rest are neglected. It won’t bring much comfort to the recod labels but Spotify isn’t having the best of times either. Although its revenues soared by 80% to €1.95bn (£1.5bn) last year, its losses widened to a whopping €173.1m. Of course most fast-growing private tech companies are expected to make a loss – just look Uber. But that’s nonetheless a lot of cash to be burning through and just goes to show that nobody has found a way to grow the music market in a sustainable and profitable way. The future of the industry sounds less than harmonic.